VX20520 WOODS, GEORGE. Submitted by Mick Monaghan (nephew). Background : The following is a diary kept by George between 06/04/1941 and 05/08/1941. 6/4/41. Left Balcombe for Sydney embarkation. 7/4/41. Arrived after travelling all night and day. Boarded H.M.S. Queen Mary at 4.15. Took as much in as possible. Scenery at night colossal. Ship magnificient. 8/4/41. Spent day looking over ship. The most beautiful ship. Is the right name for it. 9/4/41. Woke at 6am to find that we had just started moving. 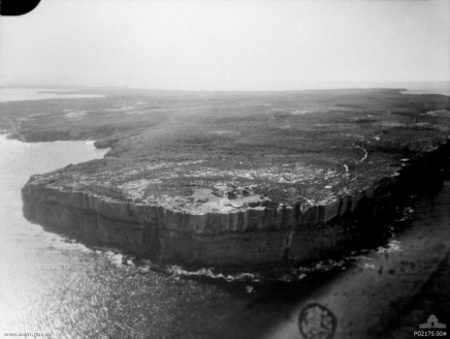 Later in the day we came into Jervis Bay and dropped anchor until the other ships of the convoy reached us. 10/4/41. Today we just sat and laid down on the sun deck and spent a very enjoyable day. 11/4/41. 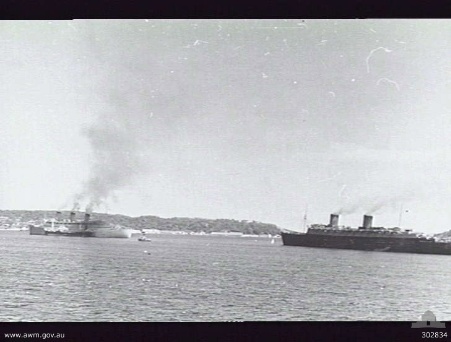 (Good Friday) After we had our church service we pulled out of Jervis Bay and steamed due east until 2pm when we caught up with the other 4 ships and then steamed south. 12/4/41. This morning we sighted the Victorian coast for the last time for a year or two. 13/4/41. A calm day at sea but storm approaching. 14/4/41. Hit storm today in Great Australian Bight. Very rough but came through without feeling sick. 15/4/41. Sea calmed down today and it is lovely and hot. 16/4/41. Pulled into Fremantle today while we take on water. 17/4/41. Lecture on tanks. Still in Fremantle. 18/4/41. Lecture on anti-aircraft. Still in Fremantle. 19/4/41. We left Fremantle today at 10am. We were dismissed from a lecture so we could get our last glimpse (of Australia) for a while. 20/4/41. Church parade as usual. 21/4/41. Uneventful day as far as excitement goes. 22/4/41. Lifeboat drill today at 11am. 23/4/41. We have been warned about getting ready as we can disembark in a hurry. 24/4/41. Today we were issued with an extra blanket. What for, I don't know. 25/4/41. (Anzac Day) Today we had a service aboard and it is the best one I have ever heard. 26/4/41. 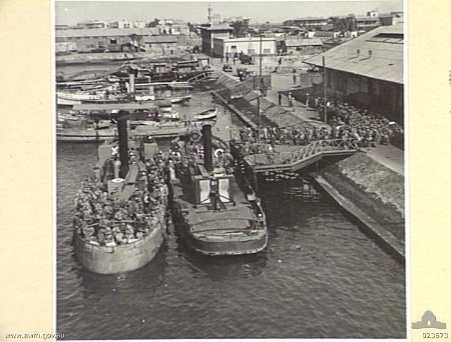 We have stopped at the British naval base in Ceylon. The inhabitants are Indians. 27/4/41. Left Trincomalee at 6pm while the band played Australia will be free. 28/4/41. Nothing to say about today's work. 29/4/41. Everything is getting that way now that the troops expect anything. 30/4/41. Reg Smith won the boxing championship to my delight. 1/5/41. The seas are getting calmer and that indicates that we are near destination. 2/5/41. Embarkation drill on lifeboat today. 3/5/41. Today we sighted our last port of call and pulled into Port Tewfik at 4pm and we were thrilled. 4/5/41. I am 21 today. 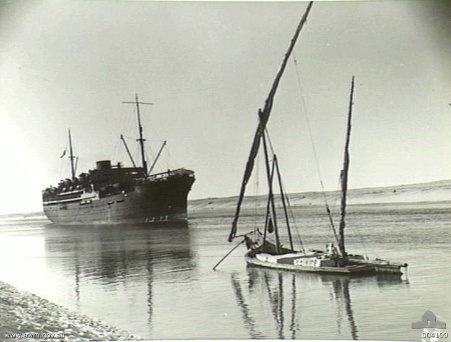 We transhipped and sailed up the Suez Canal where we disembarked at El Qantara. 5/5/41. We travelled by train all last night and at 1pm we reached our camp at Hill 95 camp. Last night we had our first real air raids which lasted half an hour, 3 times. 6/5/41. Today we started our training by marching about 5 miles through sand and the heat was terrific. 7/5/41. We have settled down to hard work. That is to make us fit for fighting. Whatever may come. 8/5/41. Received 2 cablegrams from mother and Doss (sister Dorothy). Air raid last night which lasted half an hour. 9/5/41. Today we got our first mail. I received 3 letters which brightened me up after our march. 10/5/41. Today I received 1 letter from home. 11/5/41. Today I received a cablegram from Mrs and N. Bullet. 12/5/41. Another march which was 6 miles. Rifle drill in afternoon. 13/5/41. Another air raid last night which lasted 2 hours. 15/5/41. Got paid today. 900 Mils, about 1 pound two & six Australian money. 16/5/41. Today we suffered our first casualty. One of the boys drowned. (Alfred Spiller VX22756). Four others pulled out in time. Received 2 letters from home. 17/5/41. Platoon sport which our platoon was beat. 18/5/41. Done nothing but lay in the sun and read. 19/5/41. Another route march which nearly killed us. Practicing for the guard this afternoon. 20/5/41. On guard all night and day but it was a break from the training. 21/5/41. Section stalk and compass drill. Section stalked over a distance of 800 yards to show us how it was done. 22/5/41. 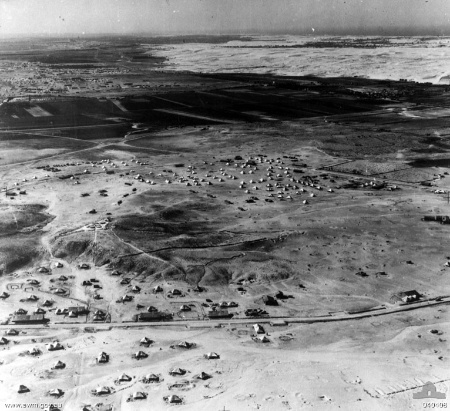 Artillery formation and aircraft deploying. Lecture on message forms and pay. Amount paid: 1000 Mils. 1 pound 5. 23/5/41. Route march in the morning, lecture in the afternoon. 24/5/41. Air raid 3am. Heard planes but seen none. Cricket match in afternoon. Beat by D company. 25/5/41. (Sunday) Rested all day after church and took over duty at 6pm until the next morning. 26/5/41. Packing our gear to go to the front for our first action. 27/5/41. Lecture on tanks, armoured cars and demolitions. Plane flying low over camp but they are not enemy. 28/5/41. At 11am we were raided by a lone enemy plane. No bombs were dropped as far as we know. Sick parade in afternoon. 29/5/41. Trench digging all day for the defence of our camp during air raids or attacks from land. Got 150 rounds today. 30/5/41. Longest march yet. Eight and a half miles in the morning. Lecture on compass and map reading in the afternoon. 31/5/41. Sick all day with stomach trouble. 1/6/41. Rested all day. Got over sickness. 2/6/41. Route march with respirators on. The sweat was terrible. Lecture in afternoon on demolishing. Pay in afternoon. 2000 Mils. 2 pound 10. 3/6/41. Patrol work and section stalk. Comments in afternoon of the morning's work. 4/6/41. Practicing how to deal with parachute troops. Digging in afternoon. 5/6/41. Speech by the O.C. about our war position. Route march. Issued with Bren & Tommy guns. Guard at retreat until reveille. 6/6/41. On guard all day. Got relieved at 4pm to get our new equipment. 7/6/41. Shooting Bren & Tommy guns. Packing in afternoon and taking down tents. 8/6/41. Left 95 at 8am. Caught train to Hadera and then caught convoy to our present position. 9/6/41. Rested all day and getting ready for the war. All the boys are waiting for the news that will send us into action. 10/6/41. Our section received a gun that was captured off the French. 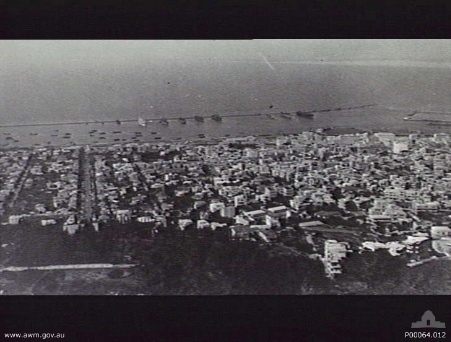 Could see the German airplanes bomb Haifa. 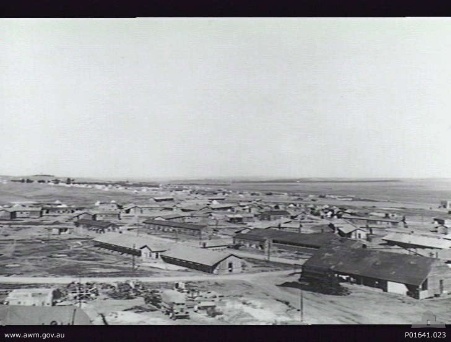 11/6/41. Today we did nothing except get lectures on the capture guns and getting them in working order. 12/6/41. Left for our front line position at 8am. Arrived in our position at 1.45pm and was attacked by airplane and machine gunned. No one hurt. 13/6/41. Went on a road making job which lasted all day. 14/6/41. 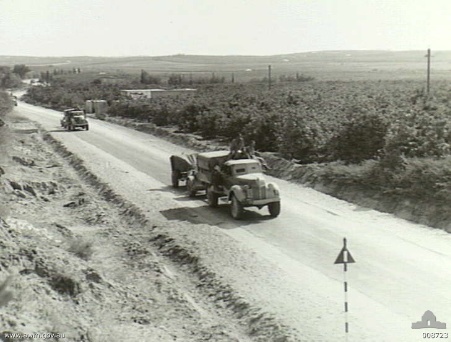 Removing French road blocks so our transport could get supplies up. 15/6/41. Moved to another position for road making. 16/6/41. Got orders at 2.15am to march back and be reserve company to an attacking force. Shelled by French artillary for half hour but no one was hurt. 17/6/41. We were removed to a front line position that the forces that had attacked, had the previous night. All are ready for action. Artillery duels all day. 18/6/41. After spending all the night in dugouts we were attacked by tanks but held our ground. When getting out, aircraft attacked and turned over one truck. The damage was light considering the amount of men in the trucks. 19/6/41. Last night was our first rest for 12 hours. Artillery going all day. We are holding an airstrip. Got shelled in afternoon. Received a letter from Doss (sister). 20/6/41. Quiet day. Got letters from Mum and Lorna & Tom. (George's sister and her husband. My mother and father). 21/6/41. We are platoon in reserve today but we expect action at any time. 22/6/41. Rested all day in defensive position. 23/6/41. Company moved up to the front line. Position for the final attack. 24/6/41. Today we captured the Fort. Whilst in the fort we were shelled and a big room was hit whilst we were in it. I received minor injuries. 25/6/41. Came down from front line R.A.P. to Haifa hospital. Treated like kings all the way down. 26/6/41. 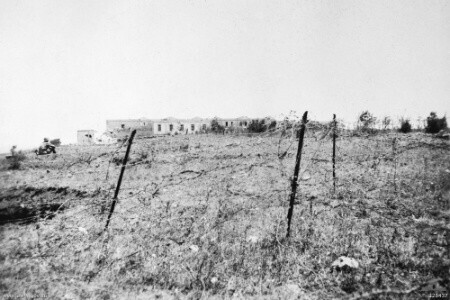 Left Haifa hospital at 11.30am and went down to Gaza Ridge Hospital where I ran into some of the old 32nd battalion. 27/6/41. Lot better today. Got pay. 2000 Mils. 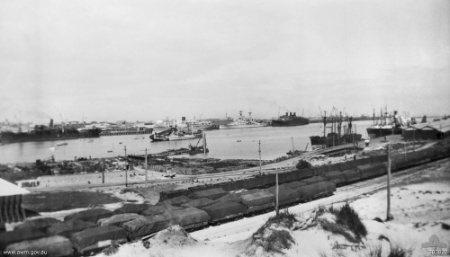 28/6/41. Got up from bed today but still a little weak. 29/6/41. Spent a quiet day lying down. 30/6/41. Reported hammer toe. Expect operation some time this week. 1/7/41. Quiet day with no worry. Transferred to new ward. 2/7/41. Went to pictures this afternoon and when I returned I got prepared for operation. 3/7/41. Got leg ready by shaving it. 4/7/41. Had my operation at 7am this morning. OK but for the reaction of toe. 5/7/41. Got another pay of 2000 mils. 6/7/41. Quiet day all day. 7/7/41. Done nothing all day. 9/7/41. Quiet day but convoy came in the night. 11/7/41. Got bandage taken off toe and the shape is wicked. 12/7/41. After being kept awake all night I slept all day. 13/7/41. Run into young Bill Nelson from the old 32nd. 14/7/41. Quiet day today but the doctor gave hints of me being able to get up soon. 5/8/41. Left hospital for the Convalescent home. 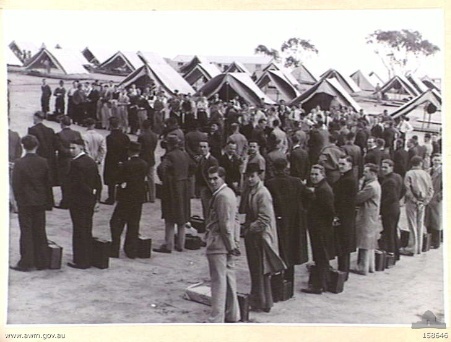 (1st Australian Convalescent Depot).